Variance of $K$-fold cross-validation estimates as $f(K)$: what is the role of “stability”? TL,DR: It appears that, contrary to oft-repeated advice, leave-one-out cross validation (LOO-CV) -- that is, $K$-fold CV with $K$ (the number of folds) equal to $N$ (the number of training observations) -- yields estimates of the generalization error that are the least variable for any $K$, not the most variable, assuming a certain stability condition on either the model/algorithm, the dataset, or both (I'm not sure which is correct as I don't really understand this stability condition). Can someone clearly explain what exactly this stability condition is? Is it true that linear regression is one such "stable" algorithm, implying that in that context, LOO-CV is strictly the best choice of CV as far as bias and variance of the estimates of generalization error are concerned? With K=N, the cross-validation estimator is approximately unbiased for the true (expected) prediction error, but can have high variance because the N "training sets" are so similar to one another. The implication being that the $N$ validation errors are more highly correlated so that their sum is more variable. This line of reasoning has been repeated in many answers on this site (e.g., here, here, here, here, here, here, and here) as well as on various blogs and etc. But a detailed analysis is virtually never given, instead only an intuition or brief sketch of what an analysis might look like. One can however find contradictory statements, usually citing a certain "stability" condition that I don't really understand. For example, this contradictory answer quotes a couple paragraphs from a 2015 paper which says, among other things, "For models/modeling procedures with low instability, LOO often has the smallest variability" (emphasis added). This paper (section 5.2) seems to agree that LOO represents the least variable choice of $K$ as long as the model/algorithm is "stable." Taking even another stance on the issue, there is also this paper (Corollary 2), which says "The variance of $k$ fold cross validation [...] does not depend on $k$," again citing a certain "stability" condition. The explanation about why LOO might be the most variable $K$-fold CV is intuitive enough, but there is a counter-intuition. The final CV estimate of the mean squared error (MSE) is the mean of the MSE estimates in each fold. So as $K$ increases up to $N$, the CV estimate is the mean of an increasing number of random variables. And we know that the variance of a mean decreases with the number of variables being averaged over. So in order for LOO to be the most variable $K$-fold CV, it would have to be true that the increase in variance due to the increased correlation among the MSE estimates outweighs the decrease in variance due to the greater number of folds being averaged over. And it is not at all obvious that this is true. These results show the expected pattern that higher values of $K$ lead to a less pessimistic bias, but also appear to confirm that the variance of the CV estimates is lowest, not highest, in the LOO case. What precisely is this "stability" condition? Does it apply to models/algorithms, datasets, or both to some extent? Is there an intuitive way to think about this stability? What are other examples of stable and unstable models/algorithms or datasets? Is it relatively safe to assume that most models/algorithms or datasets are "stable" and therefore that $K$ should generally be chosen as high as is computationally feasible? This answer follows up on my answer in Bias and variance in leave-one-out vs K-fold cross validation that discusses why LOOCV does not always lead to higher variance. Following a similar approach, I will attempt to highlight a case where LOOCV does lead to higher variance in the presence of outliers and an "unstable model". The best page to gain an understanding is certainly the wikipedia page which provides a excellent summary written by a presumably very knowledgeable user. Intuitively, a stable algorithm is one for which the prediction does not change much when the training data is modified slightly. The objective however is simple, we want to get tight bounds on the generalization error of a specific learning algorithm, when the algorithm satisfies the stability criterion. As one would expect, the more restrictive the stability criterion, the tighter the corresponding bound will be. If one point is removed, the difference in the outcome of the learning algorithm is measured by the averaged absolute difference of the losses ($L_1$ norm). Intuitively: small changes in the sample can only cause the algorithm to move to nearby hypotheses. The advantage of these forms of stability is that they provide bounds for the bias and variance of stable algorithms. 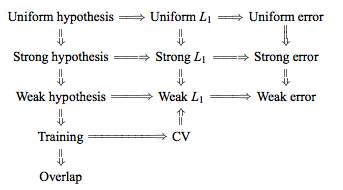 In particular, Bousquet proved these bounds for Uniform and Hypothesis stability in 2002. Since then, much work has been done to try to relax the stability conditions and generalize the bounds, for example in 2011, Kale, Kumar, Vassilvitskii argue that mean square stability provides better variance quantitative variance reduction bounds. As the $3$ order polynomial model is not regularized, it will be heavily influenced by the presence of a few outliers for small data sets. For larger datasets, or when there are more outliers, their effect is smaller as they tend to cancel out. See below for two models for 60 and 200 data points. Performing the simulation as previously and plotting the resulting average MSE and variance of the MSE gives results very similar to Experiment 2 of the Bengio & Grandvalet 2004 paper. Left Hand Side: no outliers. Right Hand Side: 3% outliers. Intuitively, [in the situation of unstable algorithms], leave-one-out CV may be blind to instabilities that exist, but may not be triggered by changing a single point in the training data, which makes it highly variable to the realization of the training set. The CV estimator of the true (expected) prediction error is based on a training set example, so here, the expectation is over training set samples, when I understand that correctly. So, what this paragraph regarding "high variance" then says is that there is a "high" difference between expected error and the error estimated by CV (which is here, the average over folds). This makes sense because the model is fit to a particular training set and because all training folds are so similar within leave-one-out. However, while the training folds are very similar within a CV round, the estimate probably differs by a lot if we swap training samples for CV. In k-fold CV, since we "diversify" the training folds, we have some averaging affect, and across k-folds, the estimates then vary less. Or in other words, the leave-one-out CV estimator is basically almost like a holdout method were you don't rotate folds and base your error estimate on one validation set. Again, over training examples, there will be a high variance compared to estimates from k-fold, where you average over folds by already training somewhat diverse models within k-fold round (in other words, if you swap training sets, the estimates of the error via k-fold probably won't vary that much). When I read some answers here on cross-validated and the internet in general, I think there seems some confusion to which estimator we are referring. I think some people refer to a model having high variance (with is ML talk for the loss having a dominating variance component) vs high variance of the k-fold CV estimator. And, another set of answers refer to variance as the sample variance regarding the folds when someone says "k-fold has high variance". So, I suggest to be specific, because the answers are different in either case. We've been through this before -- you're getting too mathematical about a dead horse. See Ron Kohavi's (Stanford-Univ) classic paper on CV and the bias-variance dilemma here. When you're done reading this, you won't want to perform LOOCV, and will likely be attracted to 10-fold CV and/or bootstrap-bias CV. You also have to think about large datasets, for which LOOCV is way too computationally expensive. At present, LOOCV is not really an option in most groups' workflows/pipelines. In the universe of all cost functions and in the universe of all feature sets, I would not assume there is an overall "stability" index, because it would not be inadmissible, and would be too prone to breaking down under an infinitely large set of conditions. Fundamentally, $k=n$ is appropriate when the d.f. and/or # parameters is so large that more training data are needed. Bias will also be greater for $k=n$, since more data are used, and variance would be artificially zero, since the training datasets are too similar to one another. 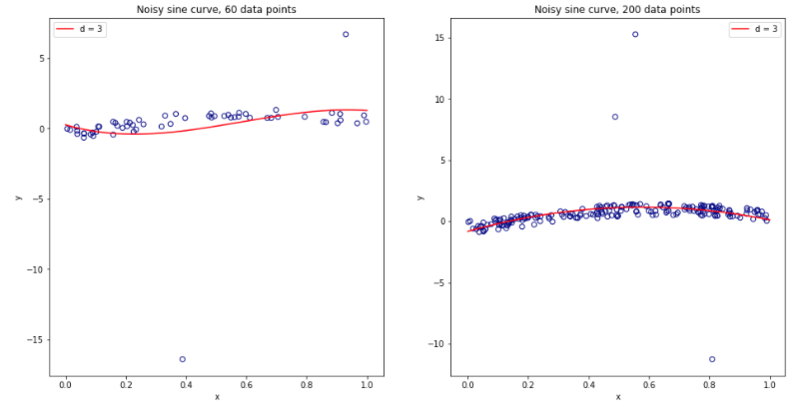 You would also be learning more noise in the data when $k=n$. LREG as a classifier would work when the data are linearly separable, but on average its bias would be too high, since many datasets are not linearly separable. Not in my view -- since there is no general rule on stability. This is open-ended and too broad, since an infinitely large number of responses can be contrived, which would not be helpful. No. No. Relying only on $k$ assumes that you believe the data. An example is Random Forests, for which there really is no $k$. While roughly 37% of the data will be used for testing (on average, 37% of objects are not selected when sampling with replacement), there are e.g. 5,000 different datasets (bootstraps) each of which are split into training/testing differently. Your example pulled from papers assumed that each dataset used was a true realization of the data -- which is an erroneous assumption. Given bootstrapping, the rule of stability surrounding $k$ is admissible, since the data sample used for a straightforward CV approach involving $k$ is not a true realization of the universe of all data from which the sample was obtained. Not the answer you're looking for? Browse other questions tagged regression machine-learning variance cross-validation predictive-models or ask your own question. Optimal number of folds in $K$-fold cross-validation: is leave-one-out CV always the best choice? Why is leave-one-out cross-validation (LOOCV) variance about the mean estimate for error high? What causes lasso to be unstable for feature selection? Why does k-fold cross validation generate an MSE estimator that has higher bias, but lower variance then leave-one-out cross-validation? Leave-one-out cross validation: Relatively unbiased estimate of generalization performance? k-fold crossvalidation: how does MSE go with k? cross-validation: what is the standard deviation if the same value is obtained for each fold? How does increasing the dataset decrease the cross validation error in case of large variance? Can we say that k fold cross validation reduces bias and variance as compared to train-validation-test split procedure? How to do k-fold cross validation with classifiers? Why is bootstrapping called an “optimistic” model validator? When should I use bootstrapping or cross validation?